TIFF (Tagged Image File Format) is a file format that is strictly used for bitmap data. TIFF files don’t contain text or vector data, even though the file format theoretically would permit additional tags to handle such data. Despite being one of the earliest file formats for images, it is still very popular today. It is a highly flexible and platform-independent format which is supported by numerous image processing applications and virtually all prepress software on the market. TIFF includes so called “tags” which either indicate the simple geometry of the image, like its size, or define how the data is arranged and various image compression options. This option allows to include all sorts of image formats in the file. However, when TIFF was first introduced, programmers were not eager to invest the time to support all of the options. As a result the lowest common denominator soon became "the" TIFF, and even today the vast majority of TIFF files, and the code that reads them, are based on a simple 32-bit uncompressed image. Nowadays TIFF has become the de facto standard graphics format for high color depth (32-bit) graphics and is widely used in image manipulation applications. TIFF files can range from simple single page file to multi page complex file. Accessing the information you need to read, print, publish and share can become a challenge and very time-consuming. Having a TIFF application to ease and streamline your workflow is essential. TIFF Split Merge is TIFF software developed for quicker and more efficient access to information needed from your TIFF files, reorganizing them in a way that makes them easier to manage and handle. With the ability to split TIFF files into separate files, either by page range or page numbers, and merge an unlimited number of TIFF files into a single TIFF file, our solution helps you gain control of all your TIFF files. Automates the process of merging multiple TIFF files. A new most handy program that helps you to solve the problem of splitting different pages inside one multipage TIFF file. TIFF Splitter is easy-to-use and has transparent interface. All you have to do is to setup it and make several clicks. It can extract pages in different ways. You can split all pages from TIF, you can split by every x page or extract only selected pages. TIFF Combiner - The Fast and Easy way to merge TIFF images. It is the windows application that can be used to combine your TIFF images. It allows you to merge one or more TIF files into one. 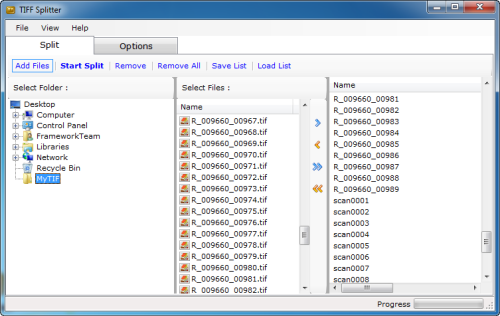 The merge functionality lets you quickly combine a collection of TIF files. Download TIFF Splitter and install it on your computer. A free trial of the program is available for download. Run the application. Click on “Add Files” to add TIFF files to the list. You can drag and drop files from the Add Files section or from the Windows Explorer. 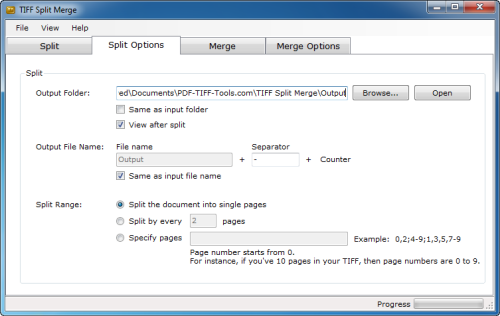 After selecting TIFF Files for splitting you can directly click on START SPLIT button to start splitting. Before that you can change the Options like split range (split the file into single pages, split by every x pages, and specify the pages). 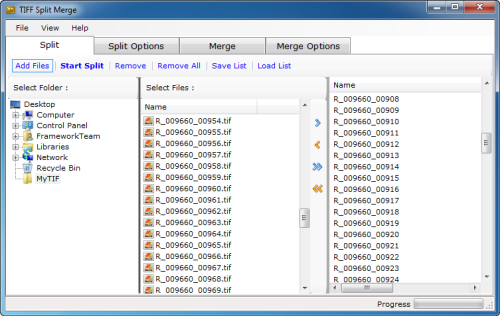 Now to split TIFF files, click on START SPLIT button to begin the batch splitting process. All of the generated TIFF will appear in a separate output folder. Download TIFF Combiner and install it on your computer. A free trial of the program is available for download. Run the application. Click on “Add Files” to add TIFF files to the list. 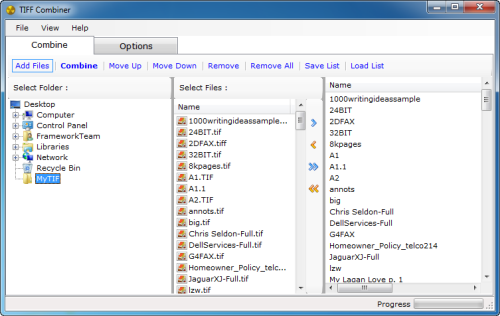 You can drag and drop files from the Add Files section or from the Windows Explorer. Now to combine the TIFF, click on START MERGE button to begin the merging process. Generated TIFF will appear as specified output file.